Home » Blog » A Fair Trade Milestone: Arizona State Becomes Largest Fair Trade University in the U.S.
A Fair Trade Milestone: Arizona State Becomes Largest Fair Trade University in the U.S. Movements for social, economic and environmental justice take time and the Fair Trade movement, specifically on college and university campuses, is no exception. This week marked an incredible milestone, when Arizona State University (ASU) celebrated their designation as the 50th Fair Trade University in the U.S. – and the largest university to achieve Fair Trade status. With over 100,000 students, and two or more Fair Trade certified products offered at 25 dining and retail outlets across ASU’s four metropolitan campuses, including coffee, tea, chocolate, sugar and apparel, they have made the largest commitment to Fair Trade of any university to date. 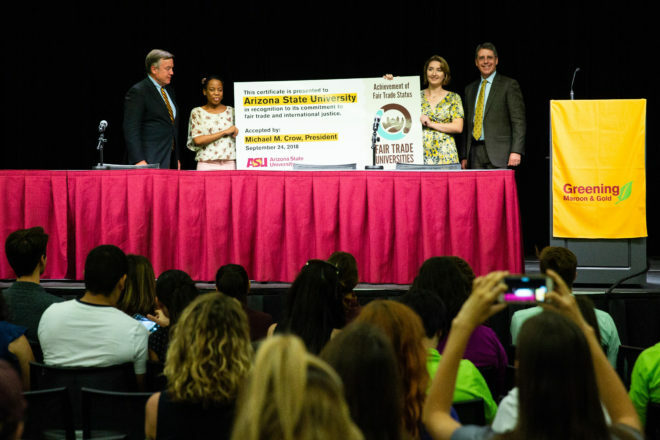 ASU State of Sustainability Event – September 24, 2018 Executive Vice President, Treasurer and CFO Morgan Olsen introduces ASU Fair Trade lead student organizer Daniella Simari and ASU alumna Sydney Williamson to present president Michael Crow with ASU’s Fair Trade University designation. Photo by Deanna Dent/ASU Now. Since 2008, when the University of Wisconsin at Oshkosh became the first designated Fair Trade University in the U.S., modeling the approach of colleges and universities in the U.K. at the time, advocacy for Fair Trade on college campuses in the U.S. has soared. What started as a group of passionate and dedicated students, staff and faculty on one campus in the Midwest ten years ago has grown to campaigns for Fair Trade on 110 campuses across the country. Increasingly, higher education institutions are seeking to source socially responsible products that deliver economic and social benefits, in addition to environmental. Today, 52 of those campuses, including some of the largest universities in the country – Texas A&M, UCLA, UC Berkeley and ASU – have completed the steps required to earn Fair Trade status. This growth in Fair Trade advocacy on campuses has grown out of the passion and dedication of students, staff and faculty, supported by collaboration, partnerships and a desire to leverage institutional purchasing power to have a positive impact on producer communities around the globe. So how exactly did Arizona State University become the largest Fair Trade University in the U.S.? The answer lies in the perseverance of ASU students, and strategic collaboration and partnerships with key stakeholders on campus, including staff, faculty and administration. The Fair Trade campaign at ASU was established to provide students access to Fair Trade products as well as educate students about ethical consumption practices. ASU students initiated the campaign in Februrary 2017, in partnership with their dining services provider, Aramark. 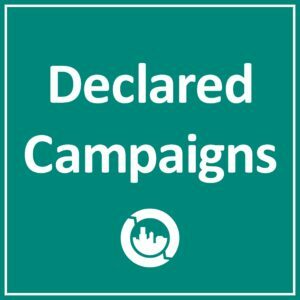 Today, the campaign operates under a core committee of students and staff. Collaboration made this effort a success, thanks to the combined efforts of University Sustainability Practices, Aramark, Sun Devil Dining, Follett (the campus bookstore provider) and student leaders. During the 2017-18 academic year, student leaders worked with University Sustainability Practices to draft a Fair Trade resolution that was signed by ASU President Michael Crow in spring 2018. In addition to University Sustainability Practices, the campaign had a great deal of support from Aramark and Sun Devil Dining staff and leadership, specifically around facilitating Fair Trade certified product placement across 25 campus dining and retail outlets. Now that they’ve achieved Fair Trade status – and earned the title of largest Fair Trade University in the U.S. in the process – members of ASU’s Fair Trade campaign are focused on education and outreach events to raise student awareness of Fair Trade. 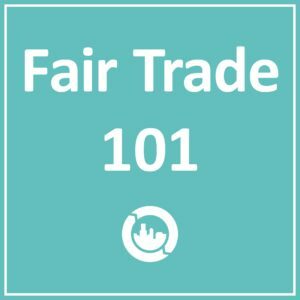 In the 2018-19 academic year, the team is working to increase visibility and signage for Fair Trade products in dining and retail outlets, incorporate Fair Trade into academic curriculum by piloting a 1-credit course on Fair Trade, and plans to become an official student organization this fall. 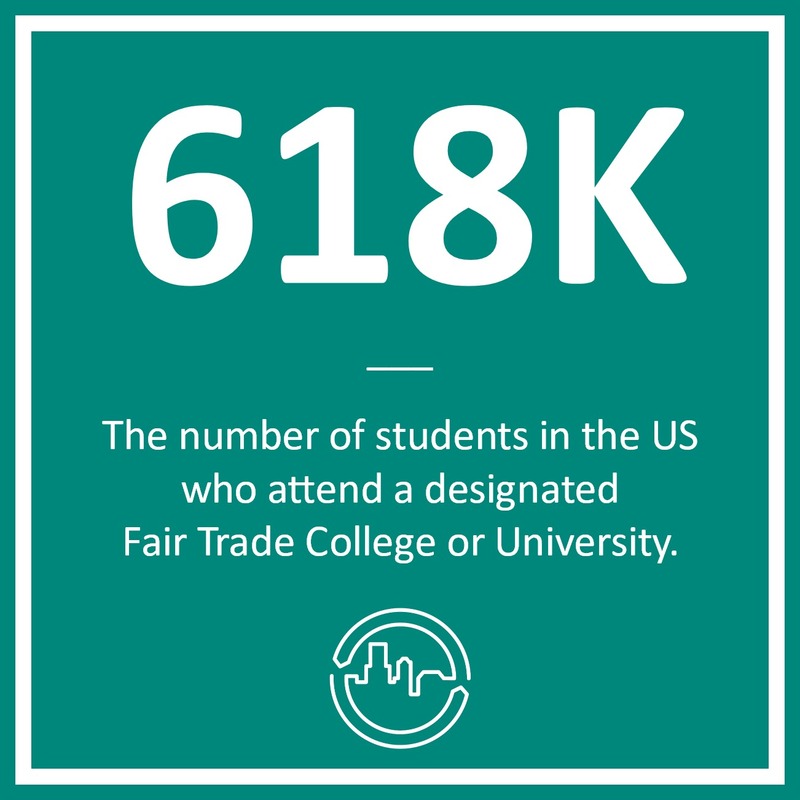 Each campaign for Fair Trade on a college campus has two overarching goals – raising awareness of Fair Trade by educating the campus community and driving impact through increasing their institution’s sourcing of Fair Trade products. In addition to a guaranteed minimum price, for each Fair Trade product sold a portion goes back to producer groups in the form of community development funds, which producers democratically decide how to invest back into their communities. Given their immense purchasing power, colleges and universities are uniquely positioned to generate significant impact for producer communities around the world by buying staple products found on a college campus, like coffee and tea, under Fair Trade terms. At the core of the Fair Trade College & University program is the importance of collaboration with the wider campus community. This means obtaining buy-in from key stakeholders from sustainability, dining and administration, to student government, faculty and other student organizations working on related issues. Given Fair Trade’s core pillars of economic, social and environmental justice, there are a wide variety of connections that campaigns can make with other student groups and campus organizations. Becoming a Fair Trade College or University doesn’t happen overnight, but with the right group of committed students and stakeholders, perseverance and a desire to drive impact for farmers and workers through Fair Trade, any campus can achieve Fair Trade status. Even the largest university in the U.S.